In November 2006, New York Times reporter David W. Dunlap wrote about the selection of and caring for the sweetgums and oaks to populate the completed 9/11 Memorial Plaza. A 9/11 Memorial document from 2009 advertising holiday ornaments described the inspiration for choosing the sweetgum and the swamp white oak for the memorial's landscape. In the fall, the lustrous green and white colored leaves of the Swamp White Oak trees, Quercus Bicolor, will change to colors ranging from amber to golden brown, and sometimes pink and will serve as graceful and hopeful symbols of life and longevity. The Sweet Gum trees, Liquidambar styraciflua, will ring the Memorial glade, a clearing within the grove for gatherings and ceremonies. Sweet Gum trees have star-shaped, glossy leaves that turn brilliant colors of red and gold around the time of the 9/11 anniversary. By reminding us of the natural cycle of life, the Memorial trees will convey a spirit of hope and renewal. The plaza will be planted exclusively with swamp white oaks (which we wrote about here). A monoculture of 415 swamp white oaks! Remember Dutch elm disease? And New York City is currently dealing with the Asian Long Horned Beetle. However, the swamp white oak has no "serious" issues with pests, fungi, cankers, or wilts according to a USDA fact sheet though the same document does express concern about "oak decline" and "anthracnose may sometimes be a problem." One of our readers commented on Dunlap's article and we've included it below (thank you Helaine for allowing us to reprint your editorial here). Landscape architect Peter Walker had it right. Fall color is more than seasonal beauty: its poignancy can elicit unbidden emotion––visual ecstasy followed by an acute awareness of loss. The swath of scarlet sweet gum in September would have jarred the geometry with a bolt of intense feeling, which after all is what the memorial is meant to evoke and sustain. Landscape architecture is the art best equipped to mark the passage of time, to manifest change, and is practically responsible to do so. The flash of sweet gum would invite a closer look at the site in autumn, and annual remembrance. Design decisions that shape important public space are indeed newsworthy, and landscape architects like Walker are the poets of such space. The political interference sounds like a turf-war at the project’s expense. Would you have liked to see sweetgums at the 9/11 memorial site? Definitely. Their fall color is spectacular. And a mixed fall palette - even of only two species - would evoke New York's seasonal landscape, and a sense of place, far more than the designer's abstraction they settled for. I would have preferred even more species. Diversity, not uniformity or "strength," confers resiliency. Yes, I would have liked the sweet gums and am sorry to see they are going for a monoculture, even though I love the swamp white oak. Imagine what the planting could have been like if they'd also added Gingkoes (tired of them in NYC?) 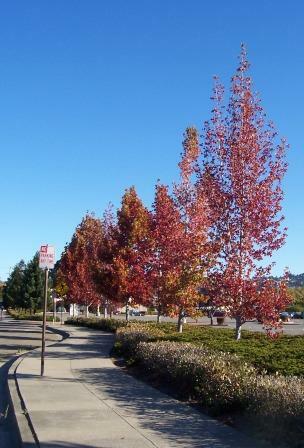 or the black gum, Nyssa sylvatica. Ok, it's difficult to transplant big Nyssa specimens, but I'm only trying to paint a picture.... I agree with Xris and would wish for more diversity. There's plenty more to choose from. When I saw the headline, I thought it had something to do with the sweet gum's little spikey balls. This reasoning is even more disappointing. Xris, Allen, Vicky, thank you for your contributions to the blog! NYC Parks has approved 20 large stature species for planting in the city. See http://www.nycgovparks.org/sub_your_park/trees_greenstreets/images/street_trees_for_nyc.pdf. informative stuff in your article. Keep it up.